By now, it was Wednesday. Even though my husband managed to work some on the three weekday travel drives, he had to get back to work 8 to 5 style and we had to get back to gettin' schooled. Prior to arriving in San Francisco, I bought 7-Day City Passes for each person in our family. The City Pass we chose gave us a pass to ride the Muni trolley, buses, and cable cars for the week and gave us entrance to the Aquarium of the Bay, California Academy of Sciences, Exploratorium, Alcatraz, and the SF Museum of Modern Art. It was a perfect purchase for how much time we had in the city and how much I love mass transit! For the kids and I and our week in downtown San Francisco, I had planned to do our math and language arts in the early morning (hooray for two hour time change!) and then head out for hands-on adventures in science and history for the rest of the day! For our first full day adventure after bookwork, we walked down to the San Francisco Bay to see the Golden Gate Bridge and visit the San Francisco Maritime National Historic Park (Free with our National Parks Pass!). 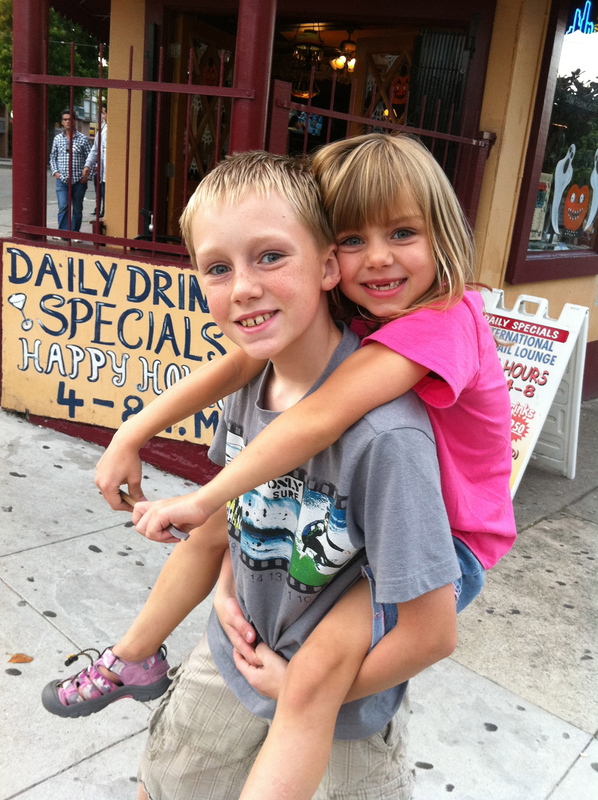 Then we walked two miles along the Fisherman's Wharf to get to our science field trip location of Aquarium of the Bay. Aquarium of the Bay focuses on the animals that live in the bay itself. While it is not a large aquarium, our kids are incredibly knowledgeable about sea life so no matter the size it is fun to watch what they've read in books come to life. The Under the Bay exhibit of clear glass tunnels was where our kids competed to name all the species without aid, as well as discover new things about the animals they love so much. The Touch the Bay exhibit was for interacting with sharks, rays, skates, and sea stars - and by interacting, I mean you get to touch them! For our son who is incredibly passionate about sea life, this was a step toward a dream come true. 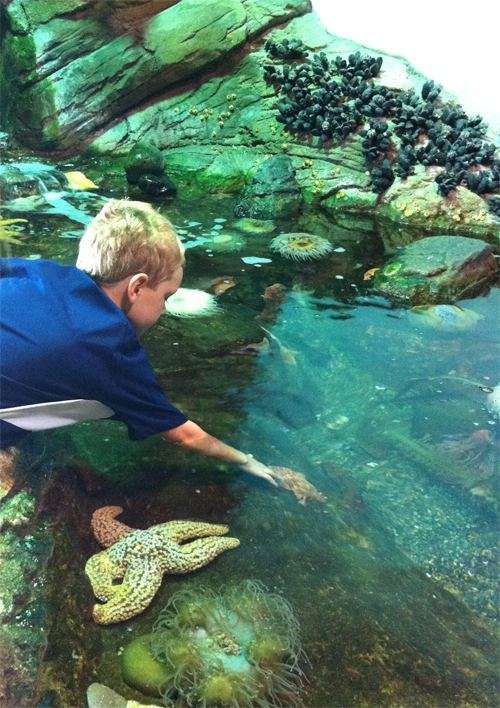 He has always wanted to touch a sea star in the wild and touching one at an aquarium was getting closer to his goal. After stopping to learn, see, and smell the Pier 39 sea lions and enjoying the musician street performers along the way, we hopped on a historic SF cable car and headed to the original San Francisco Chinatown. SF's Chinatown is considered the oldest and largest Chinatown outside of Asia. I loved this place before I went there, after I went there, and was incredibly excited to bring my kids there - yes, all by myself. :)! Hanging out in Chinatown was a wonderful lesson in culture and history for our kids and undoubtedly/still one of the kids' favorite memories of SF. From the goofy shops to the crazy food and herb stores to the amazing and sometimes disturbing smells to the fact that all the people were speaking Chinese dialects, they loved it all so much. And once we found our way to an authentic Chinese restaurant for a very late lunch, the kids had all declared they were in heaven! After spending all afternoon enjoying the sights of Chinatown (the kids finding souvenirs, too! ), we hopped back on the cable car and headed toward home to meet Josh for a late dinner (and beers!) at a wonderful place called La Trappe Cafe. Goodness, I love this city and I had so much fun sharing it with our Three.